Depending on where you live you may think streets are for people or for cars. The correct answer is that streets are for moving people and not built for the need of inanimate objects. In an interesting series of videos the Toronto Star’s Christopher Hume examines the different urban design decisions between suburban and urban neighbourhoods. The urban areas that promote cycling and walking are understandably the most vibrant, interesting, and productive (economically and culturally). The impact non-car uses can have on streets is evident and something that every city can benefit from. Unsurprisingly, Toronto’s most vibrant streets — Queen, College, Bloor — are generally narrow car-slowing thoroughfares lined with unspectacular buildings between two and six storeys tall — hardly the stuff of vehicular convenience. The major interruptions in these mostly intact streetscapes are largely the result of clumsy modern interventions beginning in the 1950s and ’60s. Decades later in what’s now Vertical City, we still have difficulty making buildings work at street level. Architects are slowly learning, but have yet to master the skills of contextualism. They prefer the silence of the vacuum and ignore the public realm whenever possible. It’s been known for years that urban centres have a lower carbon footprint than the lands of urban sprawl. This is a for a variety of reasons and it’s rather complex, sure most of it comes down to density, but the exact know how is still being figure out. Over at Alternatives Journal they looked at how building sustainable cities makes better cities overall. This is how and why people make resilient cities. FOR EXAMPLE, existing low-density suburban developments “actually increase the damage on the environment while also making that damage harder to see and to address,” wrote Green Metropolis author David Owen. Although Forbes ranked Vermont as the greenest US state in 2007, Owen’s 2009 article revealed that a typical Vermonter consumed 2,063 litres of gasoline per year – almost 400 hundred litres more than the US national average at that time. This vast consumption is primarily due to single-use zoning and the absence of a comprehensive public transit system. Contrary to popular belief, dense cities such as New York City typically have the lowest carbon footprints. NYC emits 7.1 tonnes of greenhouse gases per person per year, or less than 30 per cent of the US national average. This is due to its extreme compactness. Over 80 per cent of Manhattanites travel to work by public transit, by bicycle or on foot. Population density also lowers energy and water use, limits material consumption and decreases the production of solid waste. For example, Japan’s urban areas are five times denser than Canada’s, and the consumption of energy per capita in Japan is 40 per cent lower. Years of car-focused suburban designs have unleashed problems in the 21st century that we will have to deal with and accommodate. The years of the suburbs are coming to an end and it can’t be soon enough. With every passing years more and more municipalities discover that urban design is the better choice. The above image is composed of data taken from a report done by Halifax in 2005. 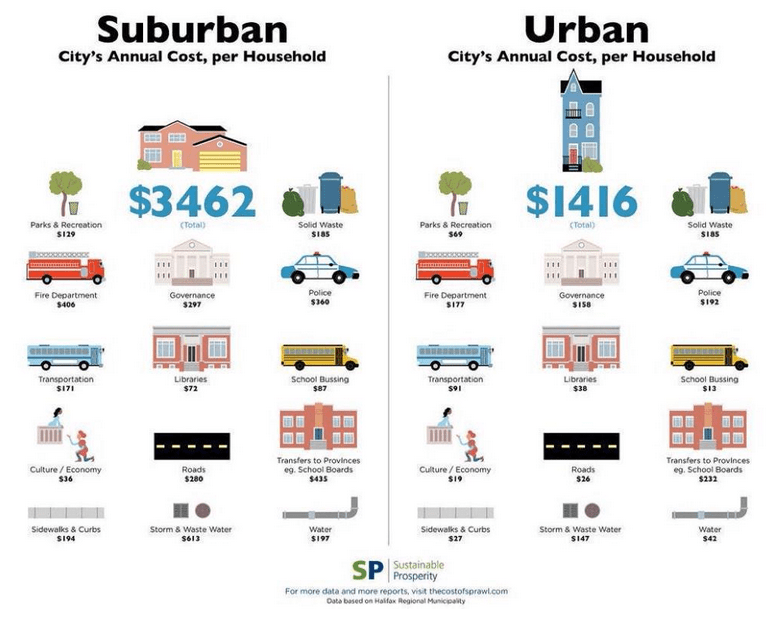 Undoubtably the costs of supporting suburban households has only increased relative to urban housing. Recently, the New Climate Economy released a report titled Analysis of Public Policies that Unintentionally Encourage and Subsidize Sprawl and advocates for a change to policies to encourage better urban design. The New York Times ran an article on urban versus suburban costs back in 2010. So we set out to do the math, based on an apartment and a house in the New York metropolitan area. Here’s what we found: a suburban lifestyle costs about 18 percent more than living in the city. Even a house in the suburbs with a price tag substantially lower than an urban apartment will, on a monthly basis, often cost more to keep running. It’s very clear that as we populations grow urban design needs to focus on sustainable infrastructure planning and all of us should encourage it.